The Tradie Box - Gifts for Men - Gifts for Men - Perth City Florist - Free Flower Delivery Across ALL Perth Suburbs when you order online - Fast Online Ordering. The Perfect Gift for the Beer loving Man that has everything! 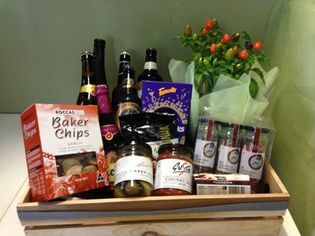 6 x Premium beers from around the world, with a selections of savoury gourmet foods, a box of delicious chocolates and a easy keep plant all nicely gift wrapped and displayed in a wooden box.